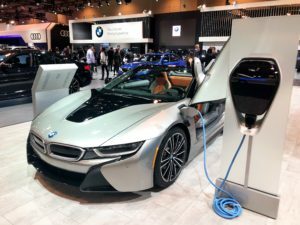 An electric vehicle from BMW gets charged at the 2019 Canadian International Auto Show. All light-duty cars and trucks sold in British Columbia would have to be zero-emission by 2040 under legislation tabled recently. Mungall says zero-emission vehicles are part of the government’s $902 million CleanBC program to cut greenhouse gas emissions by 40 per cent by 2030 based on 2007 pollution levels. HAS ANYONE MENTIONED ELECTRIC VEHICLES ARE “REMOTE EMISSIONS”(PRESUMBLY COAL FIRED ELECTRIC PLANTS, SOME HYDRO AND WIND), NOT ZERO EMMISIONS??? ?